While fact-checking “Center of the Universe” [October 2013], Jay Roberts’ account of an encounter with serial killer Randy Kraft in 1980, I focused mostly on stated facts about San Clemente: what Roberts said about the beach, the streets, the motel, the 5 Freeway onramp. Then I spent an afternoon reliving his story in the city I’ve called home for nearly two decades, starting at the shore where the two men supposedly met. Here is how the facts I verified square with Roberts’ story about what happened 33 years ago. Still popular with locals. Some signs for beach access are posted, but this is not an obvious beach choice for tourists because it’s in a neighborhood. The man Roberts encountered claimed to be a Canadian tourist, but I can’t imagine many tourists coming here unless someone told them about it. The San Clemente Pier is a more likely spot to encounter tourists. I drive the side street Roberts identified in his original draft up the hill to a building on El Camino Real that Roberts believes was the motel. The drive takes about two minutes. I doubt any tourist would take this street to get to El Camino Real because it’s extremely narrow, and I also have to make a left turn⎯without the benefit of a stop sign or light⎯across nonstop oncoming traffic to get to the building at the north end of the block. A more obvious choice would have been Barcelona. I arrive at the building Roberts identified as the motel, 616 S. El Camino Real, which now is an office building. The building directory includes Reynolds Termite Control, and a longtime employee of that company tells me the building had been a motel back in the ’80s. Still, I went to the city’s Department of Community Development office to find a permit or business license to verify that the office build had been a motel. There I discovered it was built in 1985 as an office building. I contacted the developer, whose signature and company’s name were on the documents, and he told me the lot was vacant when he bought it, and likely was vacant in 1980. I decided to contact AAA to see if any other motels were located on that street or in the area. An archivist for the Automobile Club of Southern California went through the old travel books and found that there were two other motels in the area at the time, and in a follow-up conversation, Roberts conceded that he’d identified the building using 33-year-old memories and Google Earth, and could have been wrong about the motel’s exact site. But he remains certain it was located somewhere near Trafalgar (“T Street”) and El Camino Real. I take El Camino Real to Presidio to check the on-ramp of the 5 Freeway, which Roberts suspects was where Kraft scouted for drunken Marine hitchhikers. 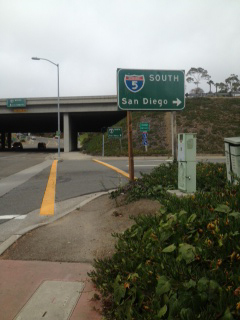 The ramp is exceptionally long because it also serves as an off-ramp for the next exit, El Camino Real. That long stretch would have allowed Kraft to easily pick up a hitchhiker and take him back to a motel without having to merge into freeway traffic. Driving the loop from the area of the building he believed was the motel to the freeway and back takes 2 minutes and 10 seconds. After retracing Roberts’ day with the man he believes was Kraft, I further check his story at the offices of Orange Coast. Hours of calls and research do not turn up anything that contradicts his account of that afternoon. Here are the main points. I pull Los Angeles Times articles that had covered the court case and examine the 1989 court opinion of People v Kraft to verify facts about the victims, as well as Roberts’ recounting of the murders. None dispute his account. 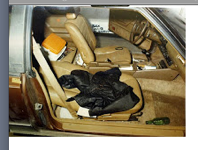 Crime-scene photos of what Roberts remembers as Kraft’s “dark car” after Kraft’s arrest show that it is brown. One photo of the interior shows a dark-green long-neck beer bottle on the floor of the passenger’s side⎯the same kind of bottle Roberts says the two shared in Kraft’s motel room. A copy of Kraft’s driver’s license confirms some details about Roberts’ account. I examine the discharge papers that Roberts provided us. They show the date he enlisted, and the date and location of his discharge. They also state that he served overseas, that he was in the 1st Battalion, 9th Marines, and that he was a rifle expert. Per military regulations, only Roberts can access his personnel files. Still, I call Camp Lejeune in Jacksonville, N.C., where the battalion now is located. First Lt. Peter Koerner discusses with me the average size of the platoon, and what special units make up a Marine platoon. I learn that since Roberts had been a mortarman, per his discharge papers, it is conceivable he could have been a scout sniper. I go through the photocopies of Roberts’ degrees from Naval Submarine School, Naval Nuclear Power School, and University of Alabama, Birmingham. Because naval school records are linked with military records, they are impossible for anyone but Roberts to acquire. Media specialist Marie Sutton of the university’s academic affairs group confirmed that Roberts graduated from UAB in 1995, with a master’s of science degree in mechanical engineering. For photos of Jay Roberts today, click here. Next articleWho Did Randy Kraft Seduce?